Deflation is the general decline in prices for goods and services occurring when the inflation rate falls below 0%. Deflation happens naturally when the money supply of an economy is fixed. In times of deflation, the purchasing power of currency and wages are higher than they otherwise would have been. This is distinct from but similar to price deflation, which is a general decrease in the price level. In effect, deflation causes the nominal costs of capital, labor, goods, and services to be lower than if the money supply did not shrink. While price deflation is often a side-effect of monetary deflation, this is not always the case. Deflation has been a popular phenomenon among economists for decades. World-renowned economist Milton Friedman argued that under optimal policy, in which the central bank seeks a rate of deflation equal to the real interest rate on government bonds, the nominal rate should be zero and the price level should fall steadily at the real rate of interest. His theory birthed the Friedman rule monetary policy. By definition, monetary deflation can only be caused by a decrease in the supply of money or financial instruments redeemable in money. In modern times, the money supply is most influenced by central banks, such as the Federal Reserve. Periods of deflation most commonly occur after long periods of artificial monetary expansion. The early 1930s was the last time significant deflation was experienced in the United States. The major contributor to this deflationary period was the fall in the money supply following catastrophic bank failures. Other nations, such as Japan (1990s), have experienced deflation in modern times. Deflation is caused by a number of factors but is largely attributed to two: a decline in aggregate demand (leftward shift in the aggregate demand curve) and increased productivity. A decline in aggregate demand typically results in subsequent lower prices. Causes of this shift include reduced government spending, stock market failure, consumer desire to increase savings, and tightening monetary policies (higher interest rates). Regarding productivity, companies operate more efficiently as technology advances. These operational improvements lead to lower production costs and cost savings transferred to consumers in the form of lower prices. Price deflation through increased productivity is different in specific industries. For example, consider how increased productivity affects the technology sector. In the last few decades, improvements in technology have resulted in significant reductions in the average cost per gigabyte of data. In 1980 the average cost of one gigabyte of data was $437,500; by 2010, the average cost was 3 cents. This reduction causes the prices of manufactured products that use this technology to fall also. Following the Great Depression, when monetary deflation coincided with high unemployment and rising defaults, most economists believed deflation was an adverse phenomenon. Thereafter, most central banks adjusted monetary policy to promote consistent increases in the money supply, even if it promoted chronic price inflation and encouraged debtors to borrow too much. 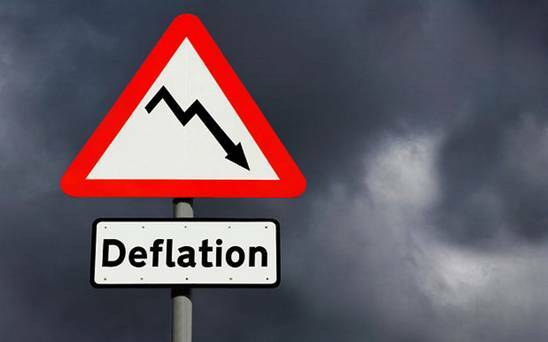 In recent times, economists increasingly challenge the old interpretations about deflation, especially after the 2004 study by economists Andrew Atkeson and Patrick Kehoe. After reviewing 17 countries across a 180-year time span, Atkeson and Kehoe found 65 out of 73 deflation episodes with no economic downturn, while 21 out of 29 depressions had no deflation. There are now a wide range of opinions on the usefulness of deflation and price deflation. Deflation makes it less economical for governments, businesses, and consumers to use debt financing. However, deflation increases the economic power of savings-based equity financing. From an investor’s point of view, companies that accumulate large cash reserves or that have relatively little debt are more attractive under deflation. The opposite is true of highly indebted businesses with little cash holdings. Deflation also encourages rising yields and increases the necessary risk premium on securities.